In 1981, Steven Spielberg and George Lucas's 1930s-style cliffhanger/serial pastiche, Raiders of the Lost Ark, took the box-office by storm. 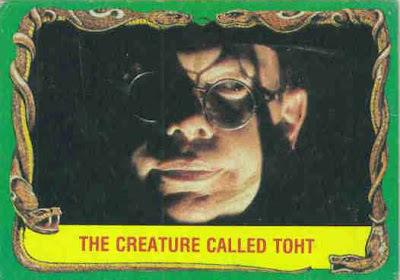 The blockbuster (and critically-acclaimed) film generated not only three successful sequels over the years (and decades), it also spawned a cottage industry of merchandise: from action-figures and novelizations to the inevitable set of trading cards. 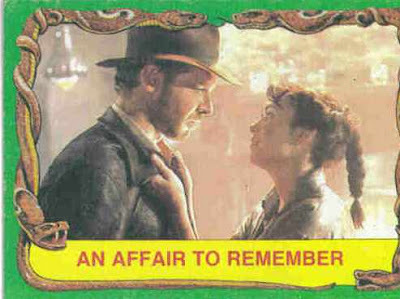 On that last front, Topps produced a nifty bunch of eighty-eight Raiders of the Lost Ark "bubblegum" cards. 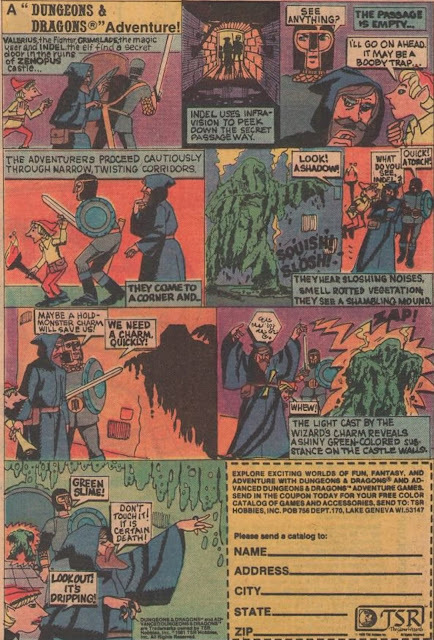 These cards depicted the characters and action scenes from the film, and rather successfully captured the movie's sense of wacky adventure with their exciting, slightly-campy captions (like "The Mysterious Medallion," "Our Heroes...Doomed?" "Marion Holds Off The Enemy!" and "Marion in a Jam!" among others...). The cards were actually kind of pretty too, decked out with a forest-green backgrounds, the photos themselves surrounded by brackets of...hissing snakes. 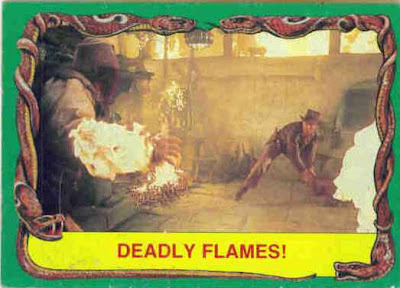 Anyway, each pack of ten Raiders cards came in an illustrated brown wrapper, and there was a stick of (hard) gum included. 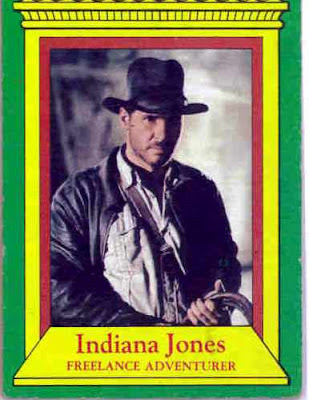 "His name is Indiana Jones, and danger is his business. So is archaeology. "Indy" travels the world in search of priceless historical artifacts, braving treacherous men and ferocious creatures, armed only with his bullwhip, his gun and his inordinate resourcefulness. He is a completely modern hero, and yet his adventures are as timeless as the ancient pyramids of Egypt." I'll tell you what: only a real man like Indy can be described as possessing an "inordinate" sized resourcefulness, if you get my drift. Marion's card terms her "beautiful" and "spirited." Sounds like 1930s pulp writing, no? Finally, with the Flying Wing moving in a tight circle, its propellers cut the giant German airplane mechanic down to size! 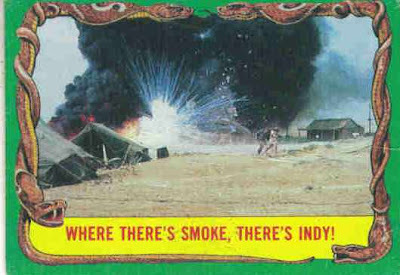 As explosions rock the sandy plains of Tanis, Indy and Marion make their way back to the Nazis' archaeological dig to consider their next move..."
Why go over virtually each visual in the film in such laborious detail? Well, remember -- this was the era before DVD; before VHS even. 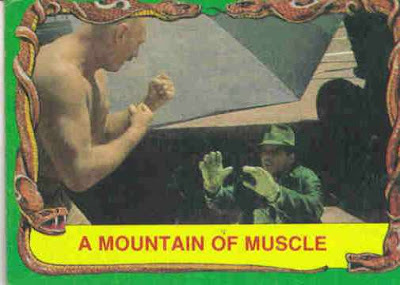 These story re-caps on trading cards were an important way for kids like me to re-live their favorite big screen adventures.